The Philips MLR is a Mixed Light Reflector shaped lamp, consisting of a low wattage high pressure mercury arc tube which is ballasted by an internal tungsten filament, the entire lamp operating direct from the mains electricity supply with no auxiliary control gear. Such lamps are nearly always provided with ellipsoidal or round shaped bulbs, but are occasionally offered in the reflector style shown here. The light reflective layer consists of a thin powder coating of titanium dioxide, an excellent white dye with very high light reflectivity across the spectrum. On top of this is a fine layer of europium activated yttrium vanadate, the fluorescent material found in most modern mercury lamps to provide some colour correction. 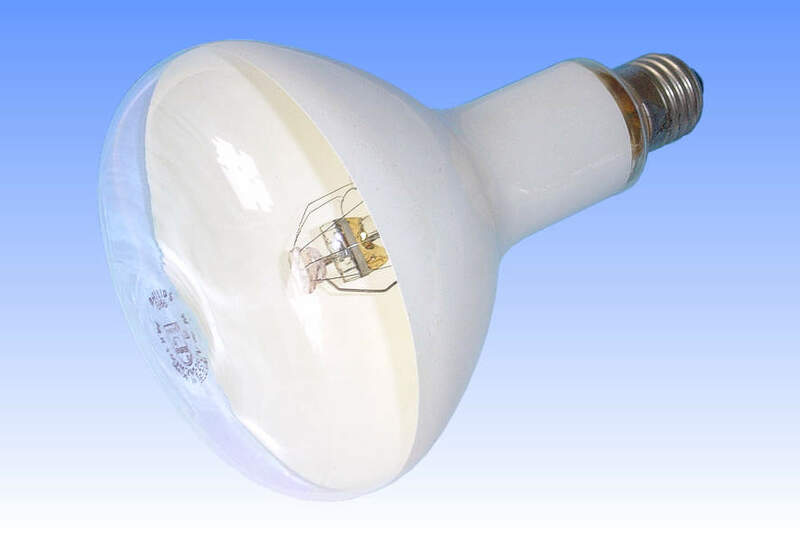 Sometimes its use is omitted though in mercury blended lamps, on account of the fact that the filament contributes considerably more red light than any phosphor coating is capable of achieving. It is worth noting that the reflector of these lamps often appears to have a slight brownish appearance. This is a thin surface layer of yellow phosphorous or phosphorous pentoxide, which is evaporated from the filament as a getter to maintain high gas purity within the outer envelope. On account of the very small size of the mercury arc tube in this lamp, heat loss via the arctube ends can be significant, with a consequent loss of efficacy as the mercury vapour pressure in the arc tube would be low. To conserve heat, both ends of the arc tube are coated with a thin film of pure gold paint which acts as an excellent heat reflector. The filament is carefully arranged around the centre of the arc tube, which helps to achieve colour mixing in the beam. References: 1) Philips UK Lamp Catalogue 1985. 2) Philips OEM Catalogue 2002/2003. 3) Philips UK Price List 1988.